The Arena District is one of the six inner city districts in the Imperial City. As its name implies, it contains the Arena (and very little else). 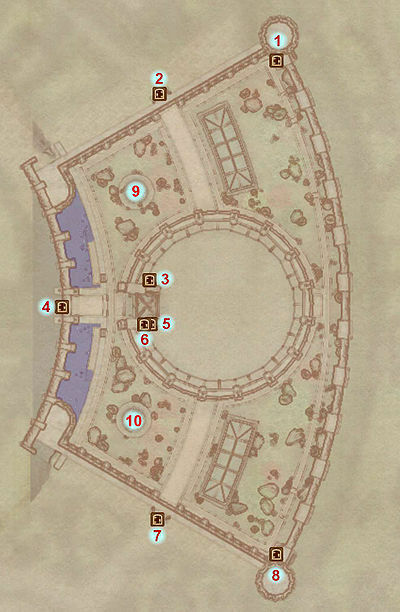 Seven additional Imperial City people may be present at the Arena Balcony at different times of the week. Against the east wall of the Arena District is an un-owned sleeping mat, which can be used as a free place to sleep if you need to level up while in the Imperial City. After watching Saliith and Branwen spar against each other for a few minutes, you will learn some "new moves" and are awarded +5 in hand-to-hand combat. You will get a message when this happens. A guaranteed magic item, the Bands of Kwang Lao, are located in this area. The gauntlets are in a locked chest near where Branwen and Saliith train. The chest is protected by a very hard lock and the gauntlets will be marked as stolen. There is also an Arena Lockbox (Very Hard Lock) that contains 500 gold coins, in between the doors that go to the Bloodworks and Arena. This is the only arena in Cyrodiil, although remains of another can be found in Kvatch. In the eighth episode of the Bethesda Podcast, celebrating the fifth anniversary of Oblivion, it was confirmed that there was originally to be an arena in every city, but there was too much dialogue and it could not fit on the disk. Removing the other arenas meant about 800 lines of dialogue could also be removed. The IDs for the remaining arena in the CS still all begin with "ChorrolArena...". Esta página foi modificada pela última vez à(s) 16h13min de 2 de março de 2013.